Tubers are various types of plant structures that are enlarged to store nutrients. They are utilised by plants to survive the winter or dry months, to provide energy and nutrients for regrowth during the next growing season. 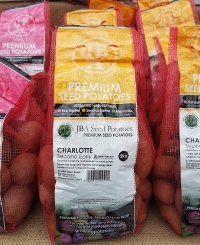 A potato that is intended for replanting to produce a new potato – and thus more tubers. These are small, new potatoes. 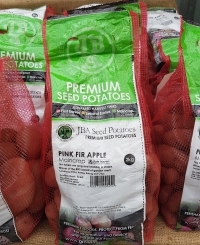 First early potatoes will be ready to harvest approximately 13 weeks from the planting date. 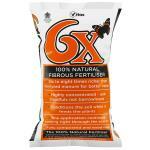 Ideal for growing in bags or containers. 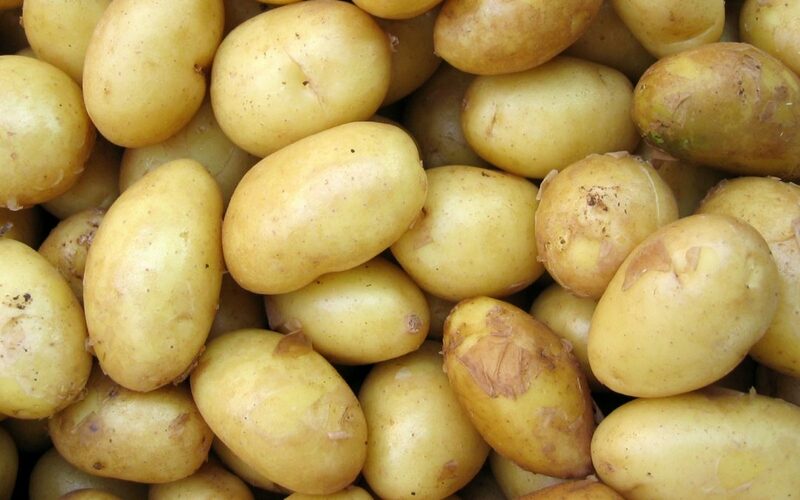 Maincrop potato varieties produce larger potatoes perfect for baking and roasting. Potatoes will be ready for harvest after about 20 weeks of planting. 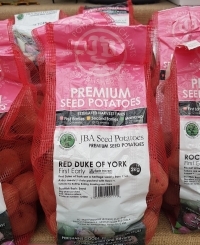 We stock a number of seed potatoes, including those that are RHS approved; varieties that will perform reliably in the garden. First earlies: Foremost, Red Duke of York, Pentland Javelin, Premiere and Rocket. Second earlies: Charlotte, Nadine and Kestrel. Maincrops: Maxine, Picasso, Pink Fir Apple, Maris Piper and King Edward. Potatoes will grow in almost any soil, however they cultivate much better if the soil is enriched with organic matter. Potatoes grow best in an acid soil so add well-rotted manure and garden compost. It is also important that you do not lime soil at any time. You will improve your crop size and yield of the seed potato by “chitting” the potatoes before planting. Stand them, rose end up (the rose end is the one with the most small dents in the skin, or ‘eyes’) in an empty egg carton, somewhere that is cool, frost-free, and in good light. The aim is to produce small, sturdy, green shoots. The tubers are ready to plant when the shoots are about 3cm (1in) long. On early potatoes, rub off the weakest shoots, leaving four per tuber. 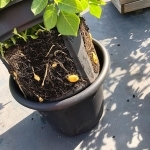 Dig a trench 15cm (6in) deep and carefully push your seed potato (with the shoots facing upwards) into the loosened compost leaving a gap of 30cm (12in) between each one. Try not to damage the shoots as you plant the seeds and ensure the potatoes are evenly spaced and not touching each other. Leave a space of 60cm (2ft) between rows. Fill the trench with soil mixed with garden compost, or other organic matter. Take five or so tubers and plant into your container around 10-12 centimetres deep, with the shoots facing upwards. Add more compost into the bag until each tuber is covered with a gap of around 5 centimetres to the top of the bag. 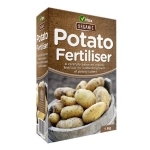 We recommend using a high potash fertiliser to help increase yields, such as Vitax Organic Potato Fertiliser. Avoid fertilisers high in nitrogen as these will delay maturity of the crop. Ensure the compost is kept moist, especially around flowering time but be careful not to saturate as this will cause severe rot. Wait until the flowers open or the buds drop; they are ready to harvest when they are the size of hens’ eggs. Wait until the foliage turns yellow, then cut it and remove it. Leave for 10 days before harvesting the tubers, leaving them to dry for a few hours before storing. Potato blight – a common disease in wet, warm summers. The initial symptoms are a rapidly spreading brown watery rot, affecting leaves, and stems. Tubers are also affected. Once blight has started it is difficult to stop. Potato blackleg – a common bacterial disease which causes black rotting at the stem base. Initial infections cause stunted growth and yellowing stems. If tubers form, the flesh may be grey or brown and rotten. Potato scab – this disease causes raised scab-like lesions on the potato surface. It does not affect the taste of the potato, and is easily removed on peeling. Potato rot – tuber rots are a frequent cause of losses prior to, or after, lifting. Significant problems often follow a wet growing season, particularly if the tubers are then lifted from wet soil.